The decision whether to get your boss a gift or not is difficult, and picking the right gift is trickier. Of course, everyone has a different relationship with their bosses. There are some that are BFF’s while others are terrifying and intimidating supervisors. Whichever the case, you must nail it when buying a gift. A simple present might change your entire relationship with your supervisor. You can get your boss a gift as an appreciation for their mentorship, inspiration, and friendship. However, you mus ensure that the award reflects the exact relationship you have with your boss. If you are close, picking a present won’t be hard as you are aware of what they like. If, however, you only meet your supervisor as they are signing documents and in the coffee room, you should consider getting them something easy and generic. For coffee addict bosses, a simple caffeinated gift will create an impact that they will never forget. Coffee is one of the most used drinks worldwide. To many people, nothing beats the heart than the thought that you can enjoy a cup of coffee at your pleasure. For this reason, picking the right coffee beans or a coffee shop with the best coffee isn’t a problem. You should realize that even the cup you put your drink affects the taste. Therefore, while buying coffee mugs for bosses, you need to be very careful. Below are some of the coffee gifts for a boss that you should try out. Landing a good job with an understanding boss gives you every reason to feel appreciative. 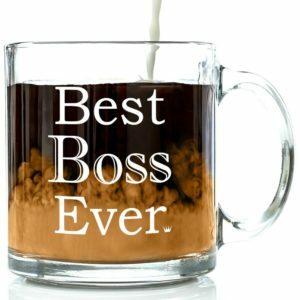 There is no better way to show your appreciation than buying a Best Boss Ever glass coffee mug. The glass material is thick and of excellent quality and therefore durable. Every feature about this mug will make your boss fall in love with it while enjoying their morning hot coffee. The mug, which is microwave safe, holds up to 13 ounces of your supervisor’s best drink. It is also popular and is perfect for both male and female bosses and doesn’t limit the age. There is also no restriction as to what occasion you should buy this gift, may it be mother’s day, father’s day, Christmas or any other celebration. The coffee mug is among one of the most popular gifts under 30 dollars and therefore the most ideal for a cheap but presentable gift. 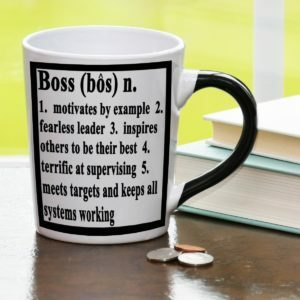 This is one of the most exquisite best boss coffee mugs you can get your supervisor either for any occasion or as a show of appreciation. The coffee cup is both microwave and dishwasher safe on top of being durable. The ceramic material is of the highest quality which contributes to the cup’s durability. With its classic design, the mug is suitable for both male and female bosses and can be used either in the office or at home. The cup is quite affordable, but considering the message, it would be a perfect gift, and any boss will appreciate it. Being a 14 ounces cup, it is neither oversized nor undersized and holds just the right amount of beverage. You can also get this mug for your colleague as a birthday gift. Even though cheap, the message and the durability of this cup are worth your consideration while purchasing your boss a gift. It is not question “How Much Should I Spend on a Gift for My Boss?”, better question is “How Much Should I Spend on a Gift for My Boss?”. 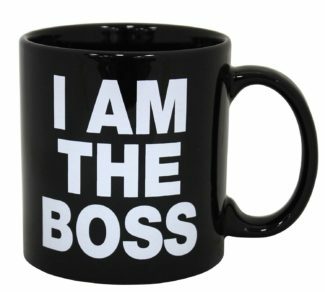 For a supervisor who loves his cup of coffee too much, this mug is the perfect choice boss gift. With the capability of holding 22 ounces beverage, well, it will be hilarious when you present it to your boss. 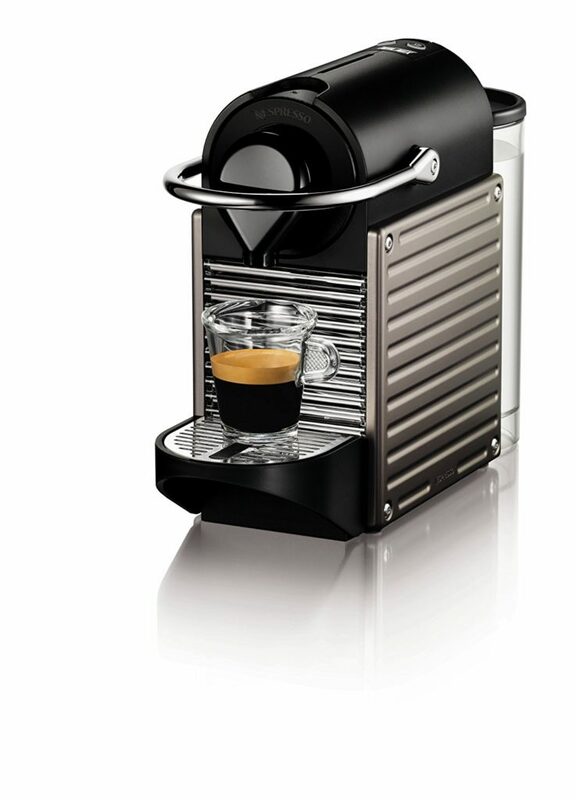 However, it minimizes the trips to the coffee maker as it can already hold a lot of drink. Nevertheless, trips to the microwave will be many if the boss doesn’t take their coffee quickly. Fortunately, this mug is safe to use in a microwave. 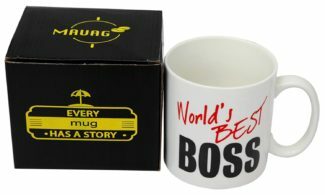 With the writings on the mug, it is a perfect conversation piece on the boss’s desk. It’s not only the size of this mug that will make your boss smile, but also the message that will reflect your compliments. The mug is unisex and also safe to use in a dishwasher. Try it out, and your boss will with no doubt love it. This Tumbleweed mug holds 20 ounces beverage and suitable for holding hot coffee, tea or chocolate. The cup can also be used for holding other stuff on your boss’s desk such as pens, paperclips, pencils, and candy. The point is that it has a sweet message that defines the qualities of a good manager. This mug is microwave safe; however, it can get scorching hot and therefore requires handling with caution. Also, to preserve the cup paintings, hand wash it instead of using a dishwasher. The cup size is perfect if you want your boss to minimize their trips to the coffee maker and especially during the cold seasons. It is also made of high-quality material and therefore highly durable. There are varieties of gifts that you can present to your boss for not being bossy. Still, in the coffee category, you can choose different coffee flavors, packed nicely as show your appreciation. Below are some of these cool gifts that you should try out. If your boss loves coffee, why not present them with a pack of coffee variety sachets from around the world? 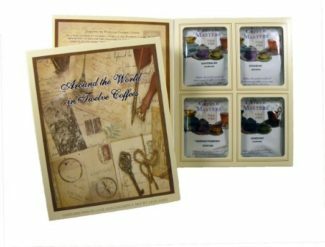 The twelve pack, 1.5 ounces packets, is a leather bound travel journal filled with 12 packets of coffee from Costa Rica, Jamaica, Zimbabwe, Ethiopia, India, Brazil, Haiti, Sumatra, Columbia, Kona, Guatemala, and Mexico. Show your boss you care and appreciate them by giving them a chance to taste coffee from different parts of the world. The pack has a date of production indicated in the inside and has a one-year shelf life. This coffee pack comes wrapped in a gift wrapper depending on your description. It will, therefore, be hard for someone to guess what you are presenting until they open. The realization will leave them dumbfounded. 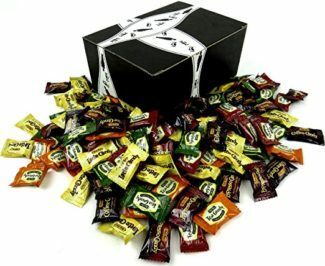 The beautiful and sturdy box of Bali’s best coffee and tea candies is suitable to be on the desk in place of chocolate. Presenting this to your boss will leave them marveled. It is filled with Bali’s best hard candies of different coffee latte flavors, iced tea, and espresso. The candies are all natural with no additives such as corn syrup, preservatives or artificial flavors and colors. They are made of pure coffee. More so, the candies are nutritious with 15 calories and 2 grams sugar. It is a great replacement for a cup of coffee or tea when one is too busy to get to the coffeemaker. If your boss has an intense caffeine craving, try presenting them with a pack of these candies and they will appreciate you always. They are affordable and do not go soft with time. They are also convenient as one can put in their purse or pocket while going to work or anywhere else. Your boss has been your greatest motivator and inspiration, and you want to show your appreciation; there would be no better way than presenting them with this gift. The gourmet coffee gift set is beautifully wrapped and ready to be shipped. 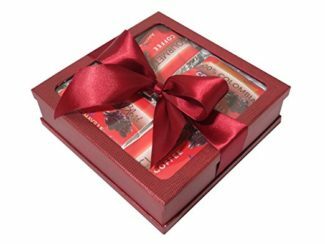 Inside the wrapper are four packs of ground gourmet coffee packages of 1.2 ounces 100 percent Colombian coffee, 2.5 ounces of Classic Blend, 2.5 ounces Gourmet Blend coffee and 2.5 ounces of Diamond Blend coffee. The gift sets are of different colors, and you can choose to meet your boss’s taste. The package is a perfect all-occasion present that will help show your boss how much you appreciate them. Since delivery takes an hour depending on your location, you can plan to have them delivered at the most convenient time. No matter the kind of person your boss is, presenting them with a coffee themed gift will make them happy. 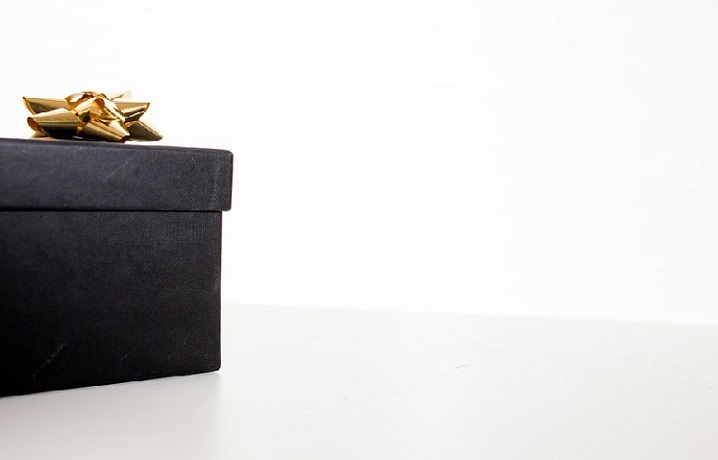 You can use the little knowledge you have in your boss to buy a perfect gift.